This perennial pre-school art project makes a fun and easy activity to do at home with your toddlers or enhance into an appealing-for-adults version. The basic prep takes only a few minutes, and the application can be as simplistic or elaborate as you want. Cut an apple in half from pole to pole, or horizontally through its equator. You can use any variety of apple, but do note the subtle differences in the patterns the stem and seeds create. You can use this ​strategically in your designs. Stick with red, green and yellow paint for realistic impressions of apples or get creative with an Andy Warhol-esque palette. Experiment with different effects depending on the amount of paint on the apple stamp, how you mix colors, and the placement of your stamp. The texture of a cut apple changes quickly once exposed to air, so either dip the cut part into acidulated water to delay browning and keep it crisp or wrap it tightly in plastic wrap or a damp kitchen towel until you're ready to use it. Cut a thin slice off the outer edge as the apple degrades to continue using your stamp. You may want to keep some apples on reserve to replace your stamp if needed. Cut the apple in half top-down to make a "traditional" apple print; cut horizontally through the middle to make apple "star" prints. Or cut an apple into quarters for a different pattern. Fold a paper towel into fourths and set it beside your paint tray. Squirt a couple of tablespoons of paint into a tray, doing the same for however many colors you want to use. Dip the cut side of the apple into the paint. Dab it around on the paper towel to wipe off excess paint, then press it onto the paper or another surface. Reload the apple stamp each time you make a new impression. Allow the design to dry completely before you display it. 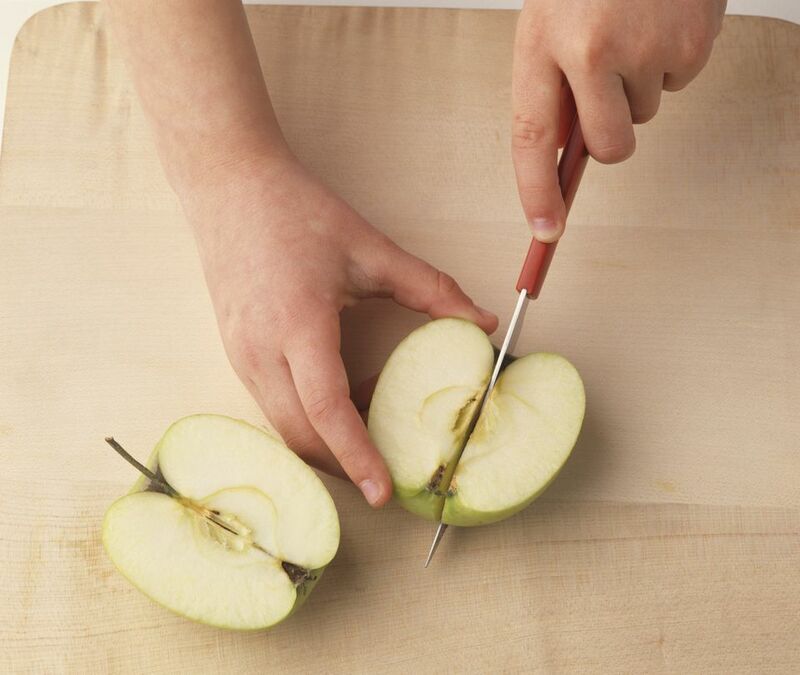 You can make it easier for small hands to grasp an apple stamp by making a small but deep slice on the uncut side of the apple, then inserting a popsicle stick into it. Or set the apple cut-side-down and slice a wedge out of each upper outer quadrant about two inches apart, leaving a built-in "handle" in the middle. Make a harvest of apple pictures this way or add other fruits and vegetables to the design. Consider citrus fruits, pears or more exotic shapes such as asparagus, artichokes and star fruit. You can choose to seal your design with a coat of varnish or a decoupage medium on paper, canvas or wood. Use fabric paint to make apple print tea towels or a canvas shopping tote and then gift it to a grandma who would cherish a child's stamped masterpiece.